Comparing Customer Experiences in Finland and Mexico – Can You Guess the Winner? It’s my third day as an intern at Cloudriven and as one of my creative tasks, I got the opportunity to write my opinion about customer experience. Since I left my start-up back home in Mexico, I have missed the start-up feeling of working with inspiring people in relaxed yet active environment. Right from the start I have felt welcome and I think part of that feeling comes from the culture of making work meaningful – which by the way is written on the office wall in huge letters – not just for our customers but for our team as well. In my opinion, I haven’t even had average customer service in Finland compared to North America, where customer service is everything. So as an entrepreneur from other culture and having worked in the tech field before, it’s refreshing to see a company that puts customer experience truly in the center of every decision. I can see it even in the little things that Finnish companies don’t notice or acknowledge the fact that they should have more emphasis on customer service. I’ll give you an example. When I go to the movies here, most of the time the service personnel to whom I pay my popcorn won’t even look at me; they just ask if I have some kind of card, which carries a name I can’t hear or understand since she is looking at her monitor, so I always say no. When I was studying in Mexico, one part of my studies was to work in the biggest movie theater chain in the country. Apart from our marketing goal which was to triple the number of customers in a weekend, we also had day-to-day responsibilities, like selling tickets and candy, waitressing at the café, and so on. They were so worried we were going to mess up their customer service that they made us take 30-day training just to work for 2 days. Just think about it! For something as simple as buying popcorn in a Mexican movie theater, they have a 10-step customer experience process which includes smiling, looking at the person, asking if they need something else, and ALWAYS ending with a friendly “enjoy your movie”. In Finland, apparently there are no steps. This is just one small example, but I can say the lack of customer service applies even to the biggest companies in Finland. As you can imagine, I have had so many cultural shocks, Finland being so different from Mexico, and one of the major ones – along with the weather – is customer service. This may sound a little dramatic, but sometimes it has made me feel myself less important. And for me, as an entrepreneur, disrespecting your customers is one of the biggest mistakes a company can make. Always make your client feel she is important! It’s something so easy and yet so crucial. And for me, as a normal person who is used to good customer service, I always prefer companies that show respect to their customers with good customer service. Start-up entrepreneur and sales and marketing specialist Carolina Robles-Lehtola moved to Finland a couple of years ago from Mexico, where she was born and raised. 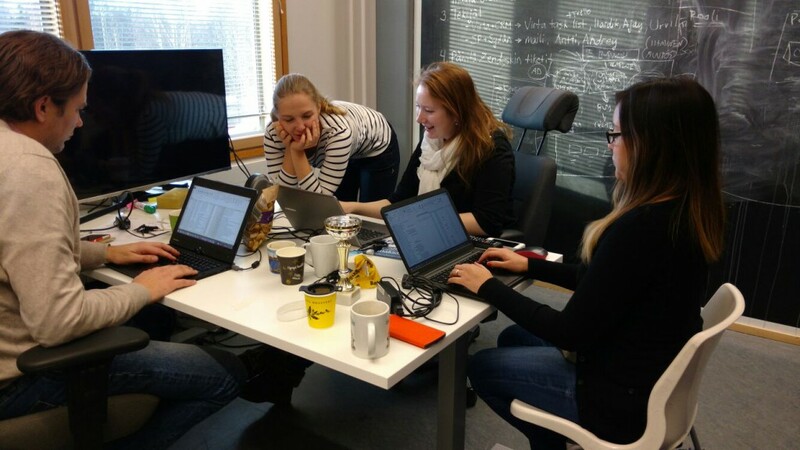 Related to her Finnish language studies, she’s doing a two-week internship at Cloudriven. https://www.cloudriven.fi/wp-content/uploads/2017/03/cloudriven_logo_white300x192-300x192.png 0 0 Carolina Robles-Lehtola https://www.cloudriven.fi/wp-content/uploads/2017/03/cloudriven_logo_white300x192-300x192.png Carolina Robles-Lehtola2015-12-02 16:02:382016-01-09 19:05:00Comparing Customer Experiences in Finland and Mexico – Can You Guess the Winner? Being a leader is really not that hard. Of course you will encounter difficult situations, but ultimately leadership is just ordinary interaction between two people. It’s all about people skills. The essence of leadership is genuine interest in other people and their work at the workplace. Unfortunately many bosses have no idea, what employees really do, let alone how they are doing. Interest in other person’s work shows respect and of course we all hope to be respected. That is to say we all want our work to matter. Showing interest is not the same as micromanaging. Employees are the best experts in their own work. At least my employees have usually done their work remarkably better than I would’ve ever done. This is especially true, when you are leading an expert organization. It’s not an overstatement to say that a good leader always hires people, who are smarter than herself. Talented employees make the boss shine. Responsibility is an important motivator. When people trust me, I want to be worthy of that trust. At least that motivates me to strive hard and exceed expectations. Positive expectations produce positive results. No one succeeds every single time, neither the employees, nor the boss. Even this situations can be resolved by relying on good manners. You have to admit mistakes and fix them. And preferably also apologize and forgive. You shouldn’t get stuck on failures, but you should learn from the mistakes. We carried out a significant organizational and cultural restructuring in my workplace, and one of the most important things was that managers took responsibility and really made changes. The initiatives came from the employees. Top management’s message to the managers was that you’re allowed to make mistakes and nothing should be left undone because of the fear of failure. If you make a mistake, don’t worry about it, fix it. But most importantly, changes have to happen. No one likes to be in stagnant water for too long. Giving feedback is an essential part of interaction at work, both critical and especially positive feedback. A thank-you will encourage you to push forward. As for corrective feedback, it’s every employees’ right. Nothing is worse than doing wrong and having no one to tell you that. The employee has to have the right and the chance to adjust her actions. In the worst case scenario, mistakes are caused by misunderstanding, which can lead to large-scale problems. Performance appraisals with my employees have always been the highlights of my work year. It’s great to be able to listen to people talk about their work, accomplishments and expectations. What’s even greater is when you can give feedback, perhaps trust an employee with even more responsibilities, and begin to execute development plans together. I’m extremely impressed about how different things motivate people and how different jobs people like. I’m glad we’re not all the same and we don’t want the same things. This is why every job will eventually find its doer. When the relationships at work work, work can also be fun. My own principle has been that you should be allowed to laugh as much as you’re paid at the workplace. Honestly, it’s really fun to work with me, when things are going well and everyone is doing their part. Of course other kinds of situations can occur as well, but those can be resolved professionally. I’ve done my leadership career in the public sector, where the ways to reward are quite limited. When you can’t use money as a motivator, the other sides of work are emphasized. Job satisfaction, responsibility and challenges are even more sustainable incentives than cash. There isn’t that much money in the world that would keep me in a bad workplace. I bet the same applies to you. The writer is the Director of Urban Planning at Järvenpää city until the end of the year and the Director-General of the Regional State Administrative Agency of Southern Finland starting from 1.1.2015. “As Jesus was telling what the kingdom of heaven would be like, he said: Early one morning a man went out to hire some workers for his vineyard. After he had agreed to pay them the usual amount for a day’s work, he sent them off to his vineyard. About nine that morning, the man saw some other people standing in the market with nothing to do. He promised to pay them what was fair, if they would work in his vineyard. So they went. At noon and again about three in the afternoon he returned to the market. And each time he made the same agreement with others who were loafing around with nothing to do. Finally, about five in the afternoon the man went back and found some others standing there. He asked them, “Why have you been standing here all day long doing nothing?” “Because no one has hired us,” they answered. Then he told them to go work in his vineyard. The workers, who had been sweating the whole day, were rightfully upset. The pay was of course unjust for those, who had done most of the work, and as a compensation system, it would most definitely not be encouraging. However, the focus of the story is not in justness but in mercy. Mercy is what leads us to gamification, because usually when implementing gamification, we try to be as fair as we can. This approach is justifiable, if we are building a competition of some sort to motivate people. Yet gamification isn’t always about competition. Gamification as such does not aim for giving just rewards, but it’s a practical way to motivate people to perform desired actions. In the above story, everyone was working, which is an excellent accomplishment as such. If gamification is implemented well, it encourages many people to act. But excellent implementation of gamification encourages all to take action. Not everyone is motivated by competition and many can be intimidated if they need to compare their own performance with others. The most important thing in this case is to accept the individual as he is and encourage him to pursue goals that suit him best. In the workplace, we usually give recognition for successful performance. The value of the reward is defined in relation to the profits the company gets from work performances; the reward is never more valuable than the profit, or otherwise the rewarding system would not make much sense. We’ve adopted this approach, because the resources for rewarding are limited and the amount of resources usually depends on the profits made possible by work performance. However, gamification isn’t just about money, and profits, and sharing the wealth with the “players”. There are other resources that can be used to motivate besides cold, hard cash. The amount of these resources varies, but in some cases they are limitless. One of these resources is simply positive feedback. Gratitude never involves taking something away from someone else. A thank-you doesn’t cost anything for the giver, but it is still very valuable for the receiver and will boost her motivation. If we have an infinite resource of gratitude, what could stop us from being as merciful and encouraging as the man in the story? Gamification is all about giving a man the thing he needs to perform the right actions. Not just the thing he deserves based on the results. A well gamified workplace is employee’s heaven. The writer is in charge of Cloudriven’s consulting services in gamification, training and competency development and in addition to engineering, he has studied theology. Read more about Juhani’s thoughts on gamification from his Gamify blog. https://www.cloudriven.fi/wp-content/uploads/2017/03/cloudriven_logo_white300x192-300x192.png 0 0 Juhani Vuoti https://www.cloudriven.fi/wp-content/uploads/2017/03/cloudriven_logo_white300x192-300x192.png Juhani Vuoti2014-12-18 07:01:252014-12-18 07:10:56What Can Jesus Teach Us About Gamification? I’m a member of the Board of the Helsinki Metropolitan Area Animal Protection Association, which is the second largest member association of the National Animal Protection Association of Finland. There’s a huge amount of tasks and responsibilities, both big and small, a Board member has to deal with. In order to stay organized and remember all the tasks at hand, we need loads of files, practices, lists and a shared place for all the information. In a volunteer-based non-profit, it’s not possible to demand as strong and time-consuming commitment from the chairperson as would be the case in paid work. I already revealed in my earlier blog post that we’re now using SharePoint team sites to make our work easier and remove some of the management burden. Thanks to donation from Microsoft, we can even use SharePoint for free. In her blog post Anna told about her experiences in leading volunteers. I will now give a few concrete examples of how SharePoint team sites can benefit your association. Our team site has a SharePoint library, where we keep all our Board agendas, meeting minutes and possible attachments. The files of a certain meeting are easy and fast to find, as every single file contains the meeting date and the participants as metadata. We also have a calendar in our team site, and we use it to save all our events. Earlier, the events we participated in were only mentioned in the Board’s meeting minutes. Now all the events are listed in one place and the calendar fields tell us, who was in charge of the event and which volunteers were there to help out. Our webmaster can always pick up the most interesting events and publish them on our website. It’s now much easier to report your actions, and compared to our old way of work, the improvement is significant. The task list helps me to remember my current tasks, as I log in to the team site, I can instantly check, what I should do and when the deadline is. We update the task list during Board meetings and whenever something urgent comes up. Earlier we might have just forgotten to finish certain smaller tasks, if the person responsible didn’t remember to do the task. The task list makes management and the work of the chairperson a lot easier, when you can share the responsibilities and you don’t have too many balls in the air at the same time. Work becomes more autonomous and the chairperson doesn’t have to remind of pending tasks all the time. The Excel spreadsheet listing all our volunteer animal care shelters was transformed into a SharePoint list and the column headings became the metadata fields. We’re now able to use filters to find the currently active shelters; if the shelter is passive for a certain time period – the family is on holiday, for instance –, we can input this information to the list as well. This way we don’t have to bother the volunteers with additional inquiries, because the filtered views in SharePoint handle all automatically. There’s also a list for all the homeless animals we take care of: what animal is it, who the contact person is, when the animal was handed over to us, which animal shelter the animal is now at, what veterinary treatments have been taken so far and where we found new home for the animal. When we are writing our annual report, it’s easy to count, how many animals we took care of and what species they were. We can easily examine all the other history data as well. We use the lists to cross-link data. For example in Animals Handed Over to Us list, you’re only allowed to choose a shelter that is registered in the Shelters list. In the Meeting Minutes and Agendas library, you can only choose meeting dates that are already in the events calendar. This practice minimizes mistakes and the information will be consistent. The search features are more advanced in the SharePoint list than Excel, and we can collaborate smoothly, as everyone can edit the rows at their own pace. The different devices we’re using do not cause problems anymore, and the lack of Office software or the wrong software version won’t prevent collaboration. It’s also very easy to export the lists to Excel, if you want to draw graphs or print the listing. The writer is in love with SharePoint, OneNote and all the other Office productivity tools. She’s also Cloudriven’s Head of Customer Service and Chief Trainer, who bakes the most delicious cakes. When guys from Cloudriven contacted me to write a blog post, I welcomed the challenge. After all, writing about your own thoughts is always a great opportunity to exchange knowledge as well as to invest in personal growth. Writing blogs is just a great learning method. Some thoughts about the theme were given to me in advance – the blog post should be related to management and leadership, how knowledge management and business intelligence have changed over the years. Huge increase in the amount of information is reality. And huge increase in the technical processing power is real. At the same time, the development of cloud services with lower prices are changing the business models of service providers, and the entire playground. Big Data and IoT Industrial Internet and Internet of Everything are now here integrating everything and everybody to each other. Data quality and data governance and other governance models, architectures, management models, and Master Data are being developed enthusiastically in order to create processable order in the world of data and information management. In this story, however, I choose to focus on leadership and management. Technological progress brings no doubt the majority of earnings for the majority of people, but a major change, perhaps we can call it revolutionary, is happening related to leadership. Also, this revolution touches the general public, but has so far been a somewhat troublesome theme. Quite a general problem is that the outcomes of projects are difficult to understand and take into use. Related problem is often that there are some misunderstandings and barriers between the IM function and business including top management. It can be difficult to get the management to commit to operations, which are considered very important within the organization that is developing knowledge management solutions. Very often there are also problems in defining the information business and management needs, when development processes are initiated. What could it mean in real life to understand and test our own presumptions? Personally, I can understand the information management, knowledge management and business intelligence best from the development side, i.e. from the supplier’s side. I want to strengthen my understanding of business and management needs, so first of all, a couple of years ago I started to study business economy. I recommend this for everyone. But where can I get the approach of “the other party” including the business management and leadership? Remember, we have some problems to fully understand. I am currently studying this using a series of surveys to find out the top management’s points of views related to information management and business intelligence in Finland. This year I have done two studies and received responses from about 700 directors. This valuable material increases understanding of the development of working methods and it can also be used to plan the following research areas and research methods. By expanding everyone’s own understanding, we can gradually build a common understanding. On Independence Day, December 6th in Finland, I began to read a book called Leadership Playbook (Johtamisen pelikirja) by Tero J. Kauppinen (2013). Kauppinen is a recognized Finnish leadership guru, author, management consultant and an executive himself. The Playbook gives a good outline of the management playfield from strategic intent to committed and consistent actions – from human behavior to business related things. The book is based on an extremely extensive leadership research and joint work of more than 150 leaders. I personally like structuring leadership in this manner, because it becomes possible to compare various aspects with each other, and to find connection between actions and impact. Based on extensive research and experience, Kauppinen presents the approach that in addition to the so-called strategic and operational hand, a third hand, the “middleman”, is needed to lead strategy into actions and build a bridge over the implementation gap. The strategy does not change itself into actions, because the new future challenges the existing systems and procedures, and also the existing metrics. The gap is real, and practices between strategic and operative management are still under development. It is also about change management. Often this also demands a new approach to knowledge management. I see here clear connections to the aspects mentioned above, which support for the development of methods and solutions – integrating the management of development, business and change management. The writer is an entrepreneur and a consultant at Petri Hakanen Oy (Ltd) and at BBI Group Oy. Petri is also acting chairman for TDWI Finland, leading business intelligence community in Finland, – information management professional, manager and leader, advocate for information-based management. Consultant and Interim manager at Your service.